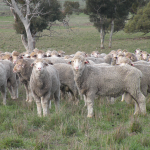 The Kelvale Poll Merino stud is a progressive stud based in South Australia. Through family succession the stud that originated in the mid north, is now based in the south east at Keith. We remain a family run business which run solely merino sheep and produce irrigated Lucerne Seed. Our stud is commercially based and we place a high importance on commercial traits, including fleece quality, growth rates, fertility and meat yield just to mention a few. Over the years we have increased our staple length and now we are at the stage of being able to shear stud and commercial ewes every 6 months. The mulesing debate has never phased us as we have developed an easy care, wrinkle free sheep which has eliminated the need to be mulesed. Successfully we ceased mulesing in commercial and stud flocks in 2008. Many of our clients are also attempting to cease mulesing in their own flocks beginning with wethers and learning about the type of animal required to cease the practice completely. We have had very successful results when Kelvale blood wethers have been fed in a feedlot, averaging 22kg plus for a dressed carcase at 8 months of age.